TUFF TILE NSA is single pack , excellent ready to use ,waterproof tile adhesive. Dosage/Coverage 6 m-75m from 25kg bag at thickness between 3mm,4mm. TUFF TILE SP is single pack excellent ready to use waterproof tile adhesive. TUFF TILE SP is excellent tiles adhesive for fixing tile or tile , marble fixing granite fixing and for vertical application also it is available in both grey and white colour. TUFF TILE JF is single pack tiles joint filler. Available in various tile matching colours. Dosage /Coverage 1kg pouch covers 10-15 RMT at 2mm. It has excellent bonding ,waterproof characteristics. 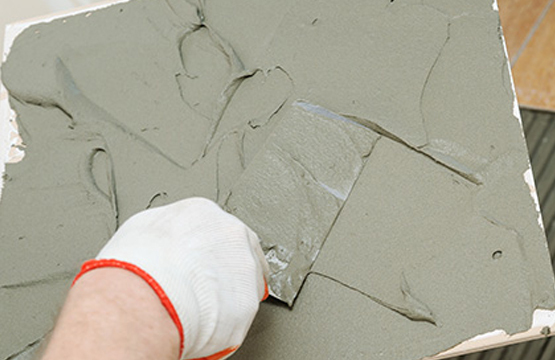 TUFF TILE GROUT (P) is powder based grout additive to be mixed during tiles fixing application mortar. Dosage/Coverage 1kg per bag of cement . It has excellent waterproof property, gets perfect bonding and economical in use. Dosage/Coverage 500 ml per bag of cement . TUFF CON TP is a high range water reducing admixture for tiles and paver concrete. It improves workability by 40% Also increases strength in 28 days for early deshuttering . it is clear transparent liquid . Dosage:-0.6%to 3% by weight of cement. Use for precast elements, bridge ,cantilever structures, prestress concrete.